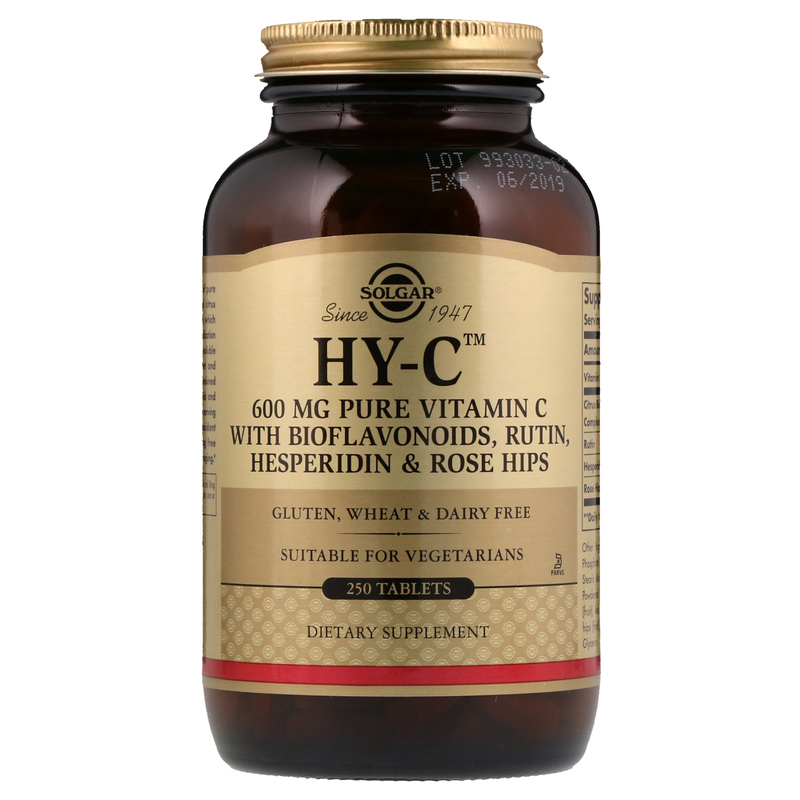 Solgar's HY-C offers 600 mg of pure Vitamin C combined with natural citrus bioflavonoids, rutin and hesperidin, which may enhance the absorption and utilization of Vitamin C. Vitamin C is a water-soluble nutrient with revered antioxidant and immune supportive properties. 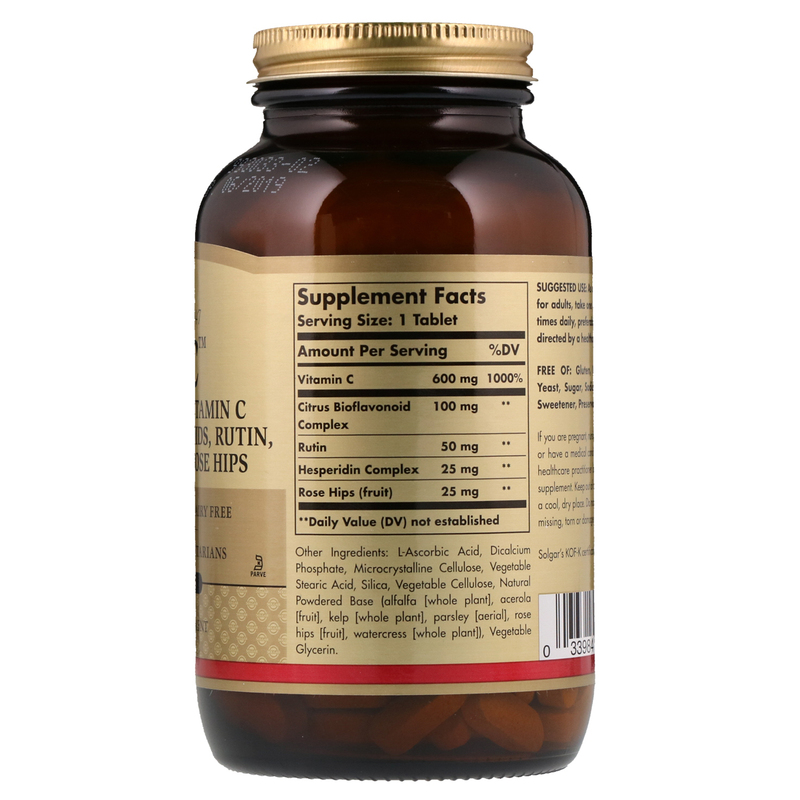 Combined with 175 mg natural bioflavonoids and 25 mg of rose hips, each single tablet serving of HY-C offers synergistic antioxidant support to combat cell-damaging free radicals which can cause premature aging. L-ascorbic acid, dicalcium phosphate, microcrystalline cellulose, vegetable stearic acid, silica, vegetable cellulose, natural powdered base (alfalfa [whole plant], acerola [fruit], kelp [whole plant], parsley [aerial], rose hips [fruit], watercress [whole plant]), vegetable glycerin. If you are pregnant, nursing taking any medication or have a medical condition, consult your healthcare practitioner before taking any dietary supplement. Keep out of reach of children. Store in a cool, dry place. Do not use if outer bottle seal is missing, torn or damaged in any way.